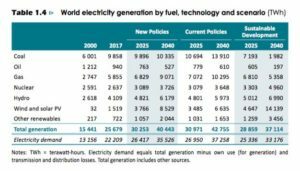 On the back of the news that New Zealand is looking at importing coal to reduce our rising wholesale power prices, the International Energy Agency released its latest report, (https://www.iea.org/wei2018/) detailing the changes required to meet the Paris accord. One of the world’s most conservative energy institutions, the International Energy Agency, has effectively abandoned the thermal coal industry, saying coal generation would have to be drastically scaled down if the world has any hope of getting anywhere near the targets needed to address climate change. 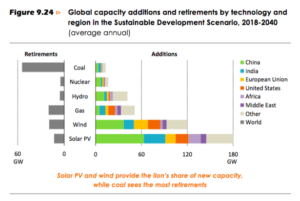 Instead, the IEA – in its annual World Energy Outlook – turns to wind and solar, which it says will need to produce more than seven times the amount of coal power by 2040 if the “well below 2°C” limit to average global warming agreed to in Paris is to be met. Last year, the IEA went so far as saying the coal boom was over. Now it is writing the industry’s obituary. It notes that solar PV is becoming among the least expensive option to produce electricity and pairing it with storage raises the levelised costs, but also increases its value by easing its integration into power systems. PV investment is largely held up by the Chinese government and their plans and despite a swing towards renewables that investment looks likely to reduce this year. For New Zealand that should be mean an oversupply of PV and cheaper panels. The biggest investment globally is the electricity sector which attracted the largest share of energy investments in 2017, sustained by robust spending on grids, exceeding the oil and gas industry for the second year in row, as the energy sector moves toward greater electrification, according to the International Energy Agency’s latest review of global energy spending. This grid improvement is required if we are to take advantage of the distributed nature of modern energy with micro grids and small storage installations. So its great to see 20,000 homes with Solar in New Zealand and the greens launch their policy what we really need is for the banks to make funding for solar easier and for consumers to realise if they want power prices to reduce they need to give the retailers the real competition that comes from setting up their own power plant.